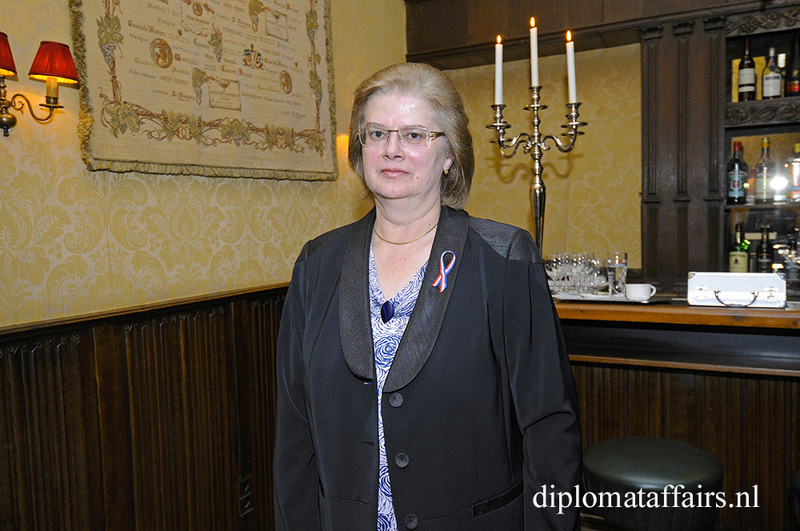 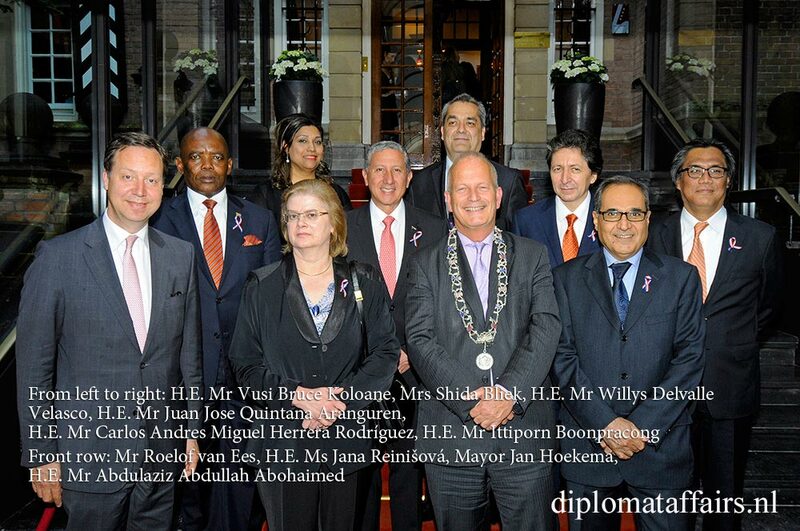 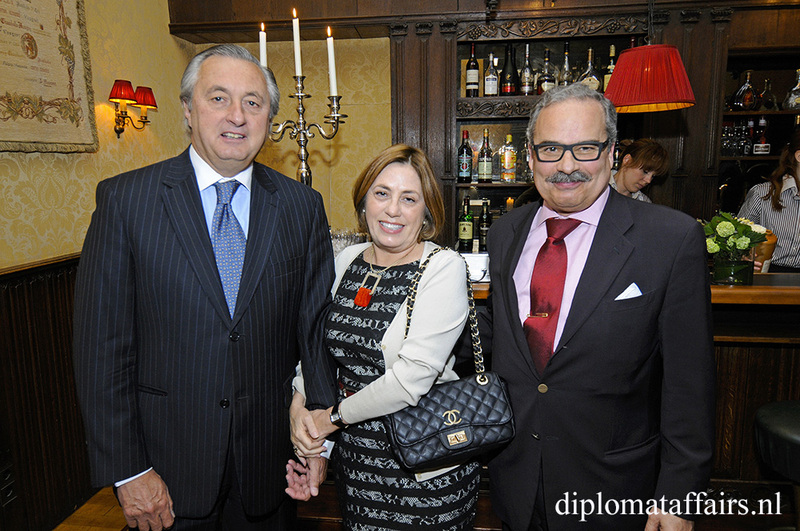 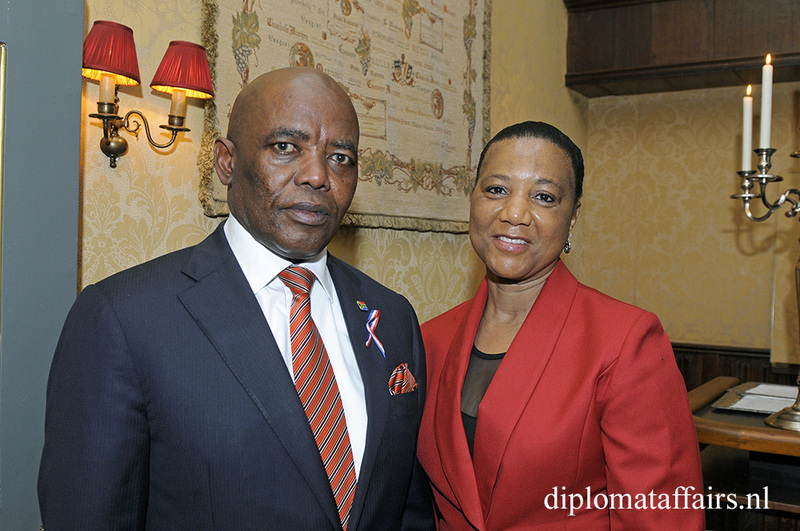 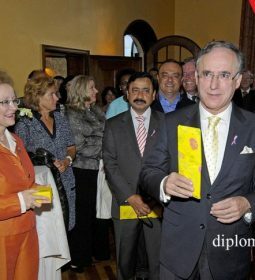 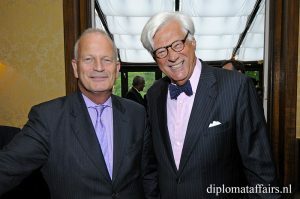 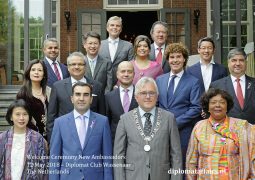 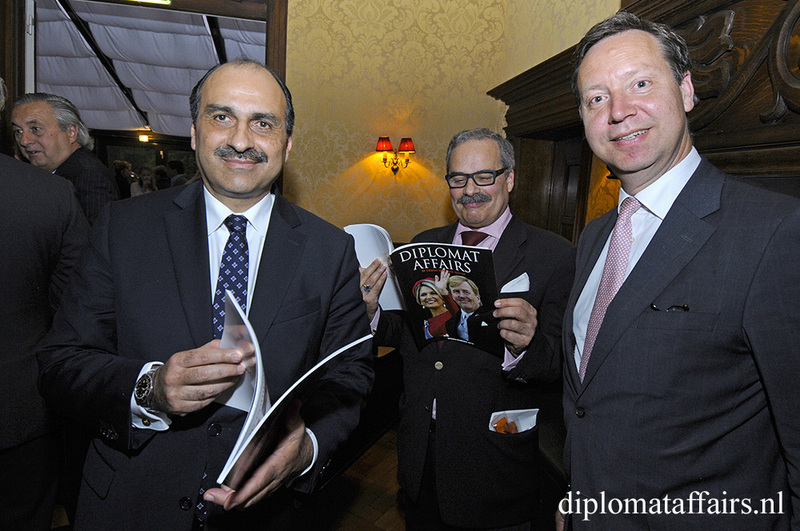 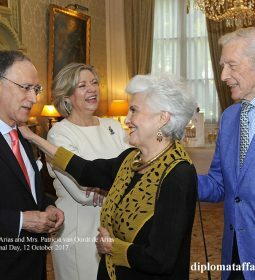 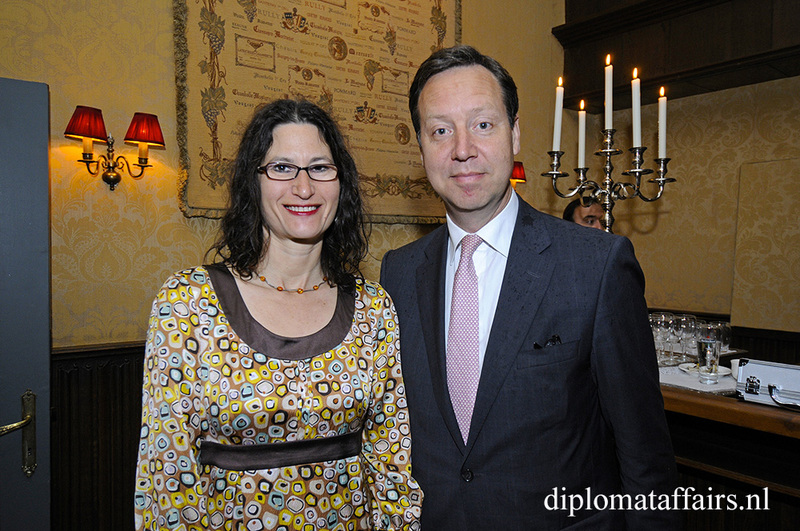 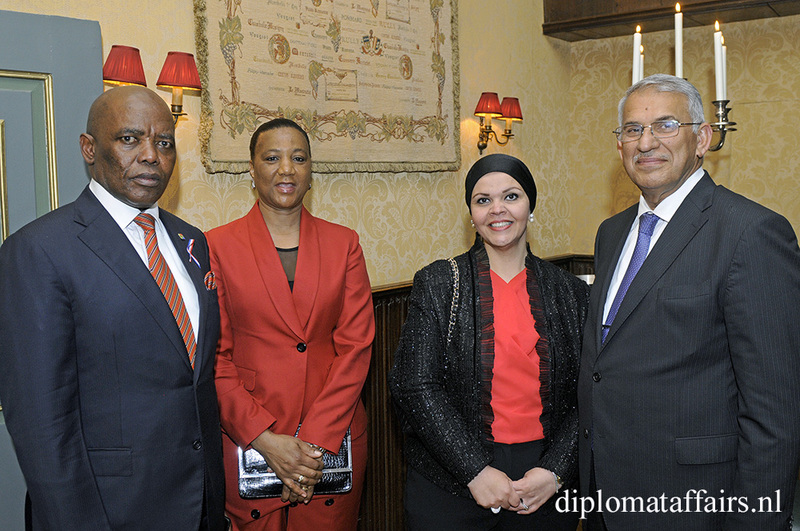 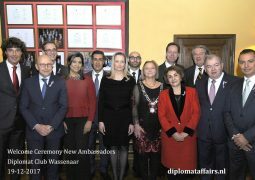 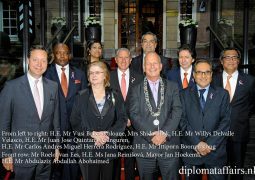 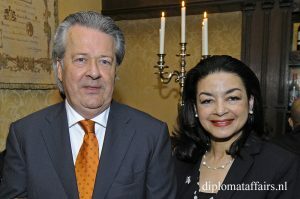 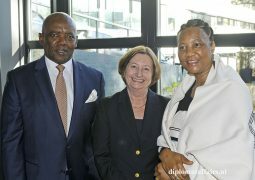 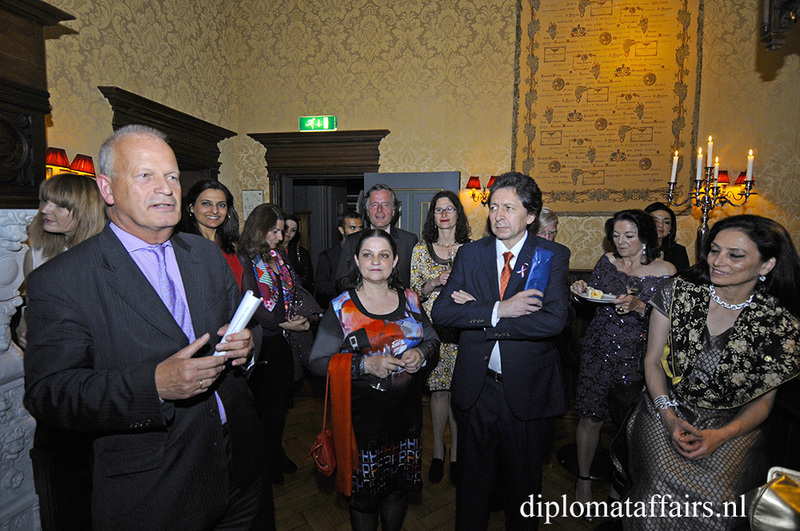 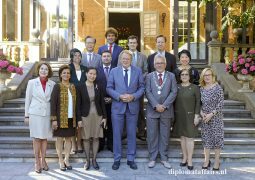 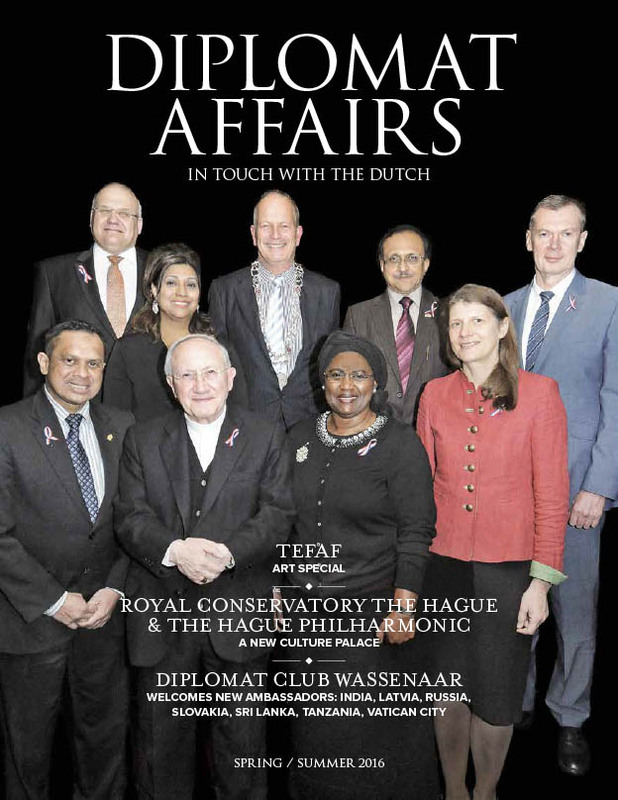 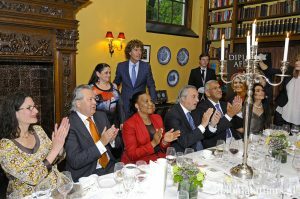 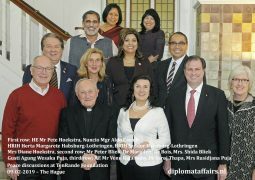 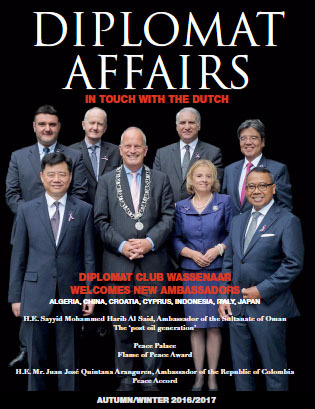 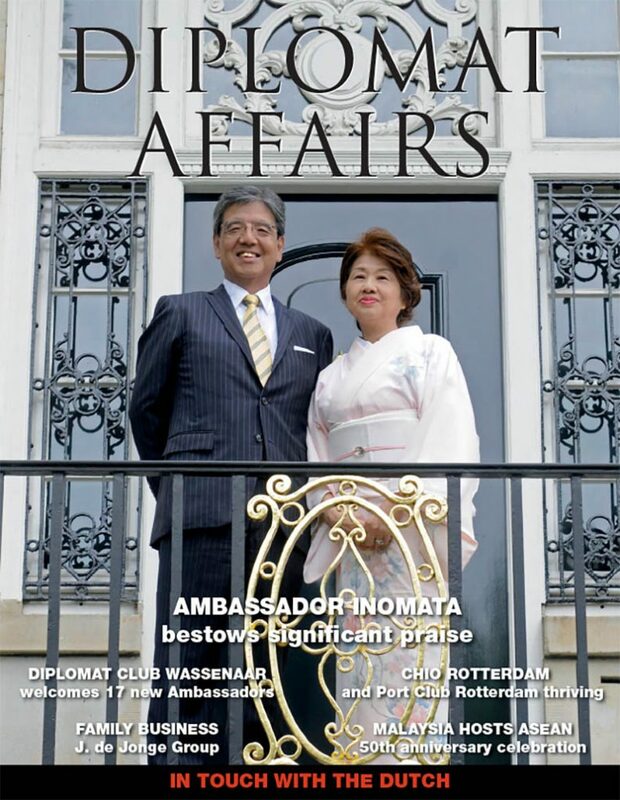 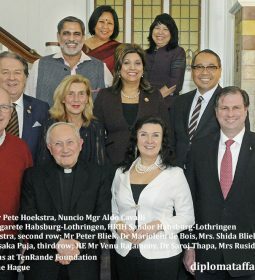 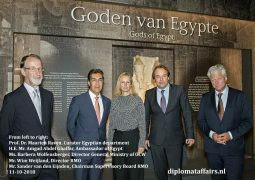 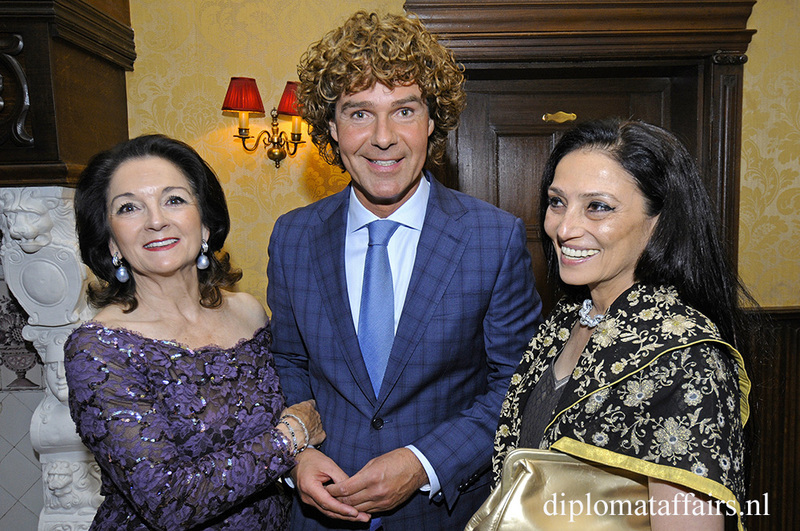 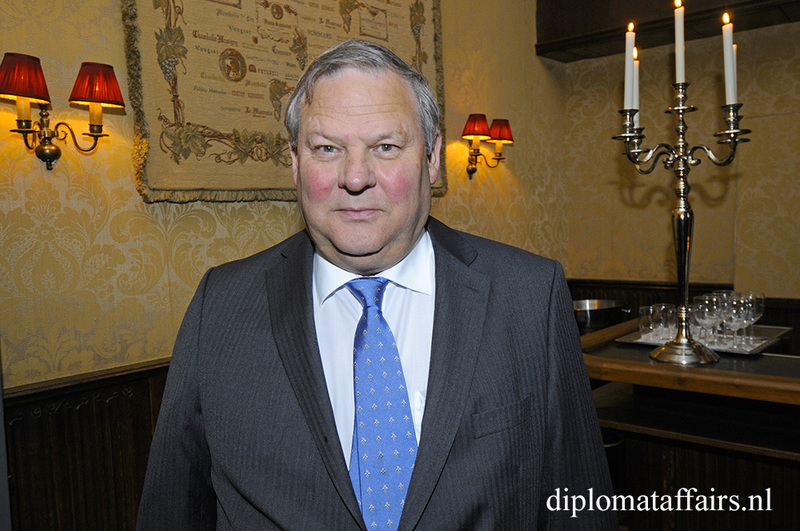 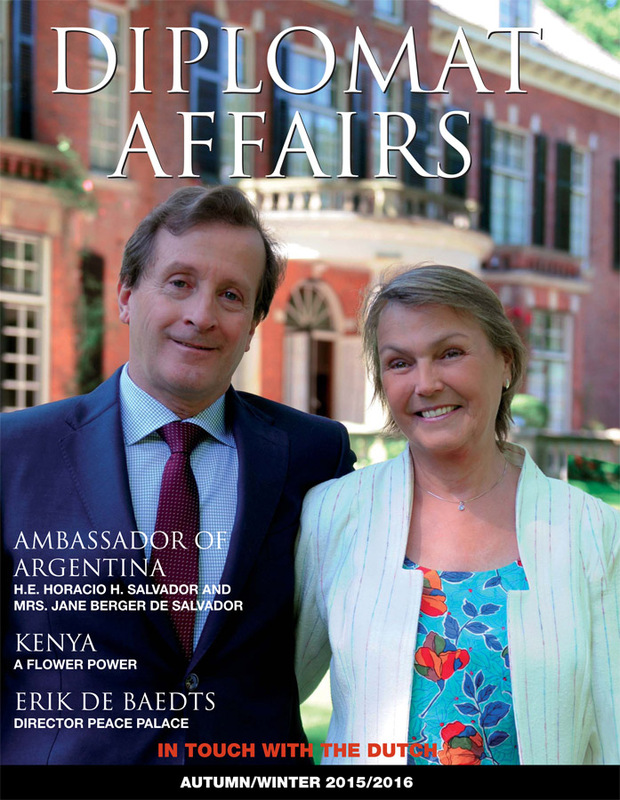 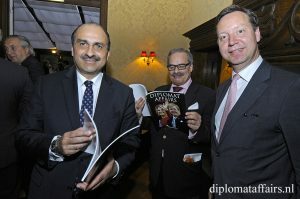 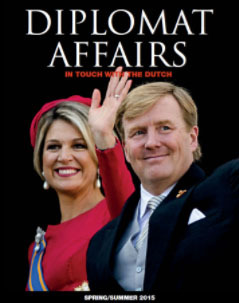 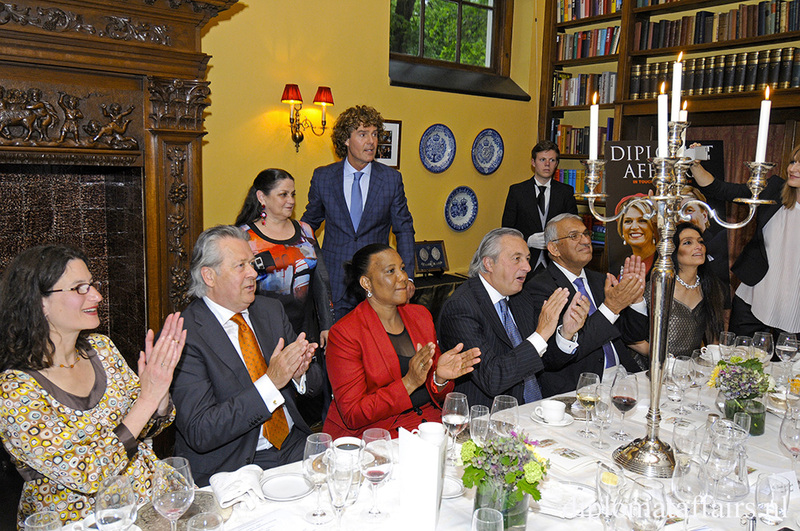 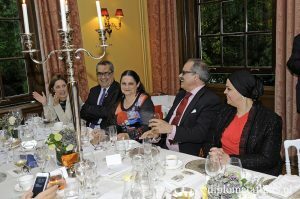 On May 31st 2015 seven newly arrived Ambassadors were welcomed at the Diplomat Club Wassenaar, located at the ‘Castle De Wittenburg.’ After Mrs. Shida Bliek, founder of the Diplomat Club Wassenaar, had provided the Ambassadors with a Dutch decoration and had welcomed them, the Mayor of Wassenaar, Mr. Jan Hoekema, held an official welcome speech and presented the Ambassadors from Colombia: H.E. 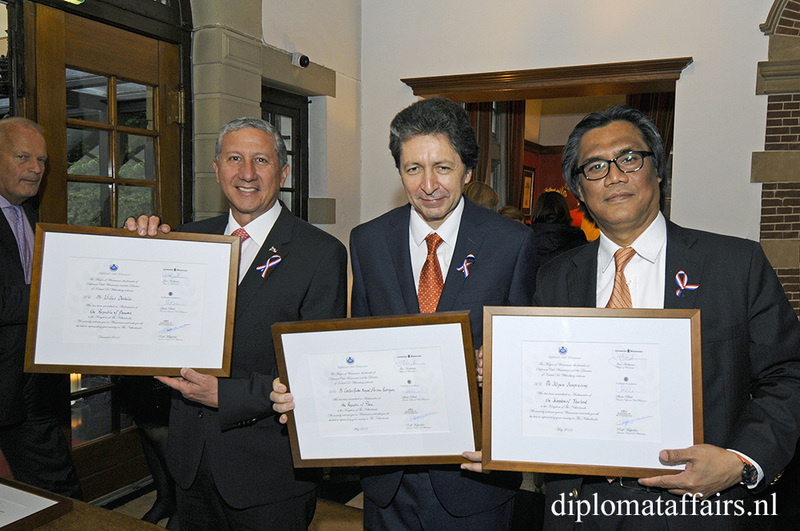 Mr Juan Jose Quintana Aranguren, Czech Republic: H.E. 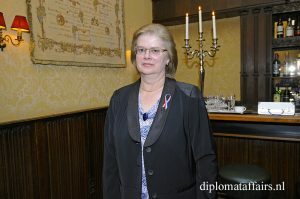 Ms Jana Reinišová, Panama: H.E. 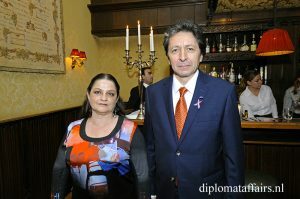 Mr Willys Delvalle Velasco, Peru: H.E. Mr Carlos Andres Miguel Herrera Rodríguez, Saudi-Arabia: H.E. 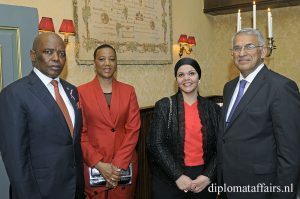 Mr Abdulaziz Abdullah Abohaimed, South-Africa: H.E. 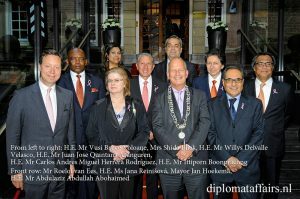 Mr Vusi Bruce Koloane and Thailand: H.E. 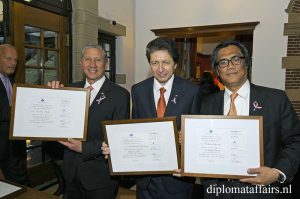 Mr Ittiporn Boonpracong with welcome-certificates. 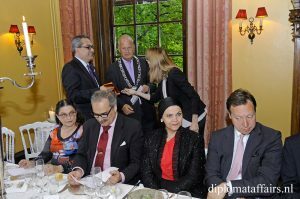 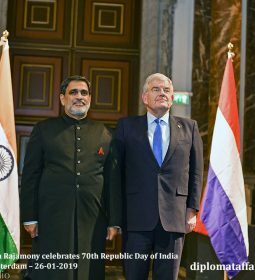 During his speech the Mayor briefly touched on the imminent farewell of Ambassador Prasad of India, and praised his achievements. 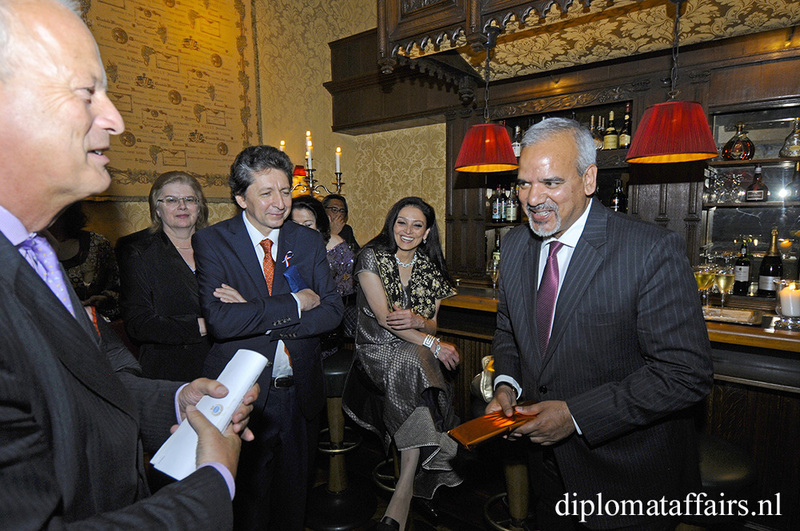 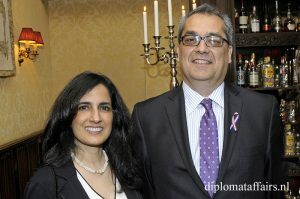 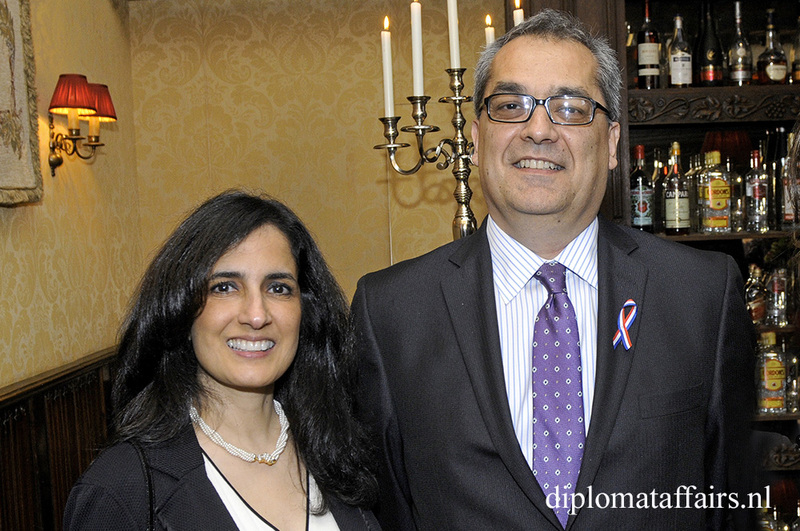 Ambassador Prasad will return to his home country to retire. 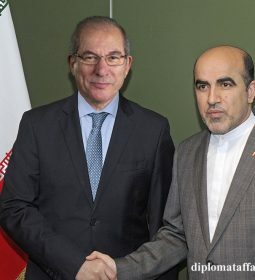 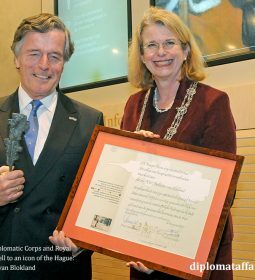 At the same time Mayor Hoekema congratulated Ambassador José De Bouza Serrano of Portugal on the fact, that his posting will be extended by one year to 2016. 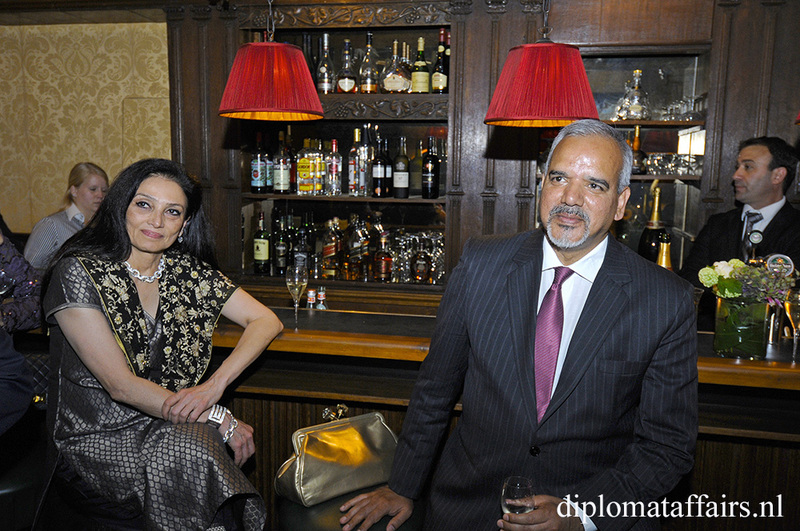 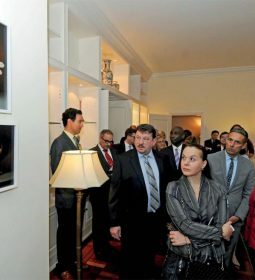 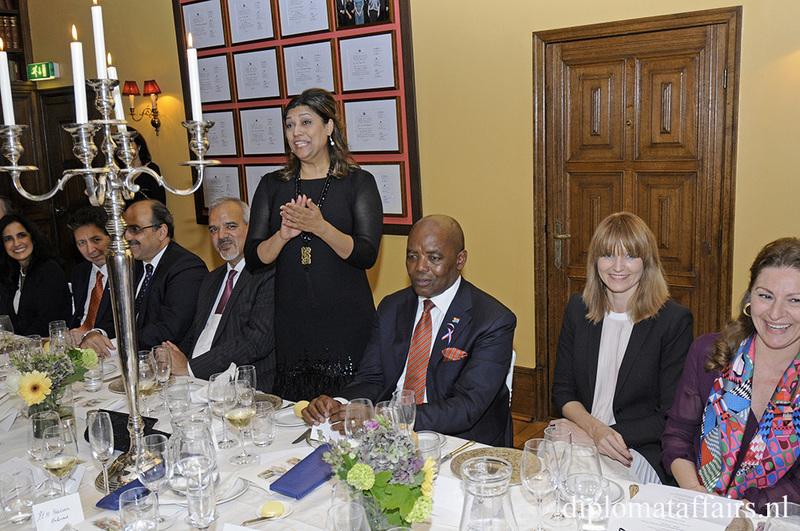 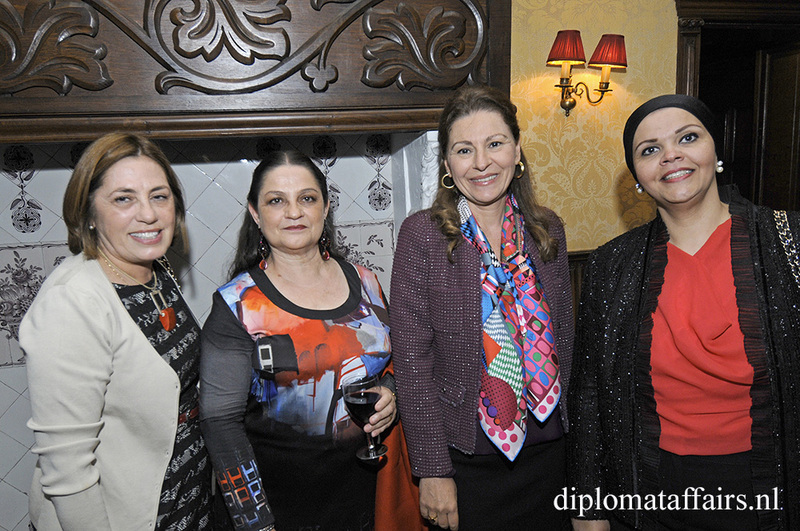 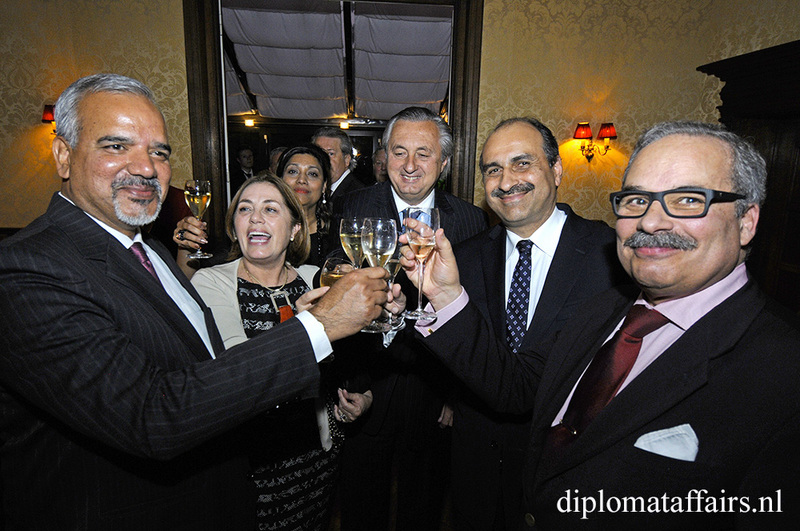 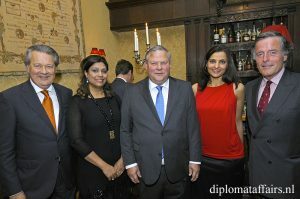 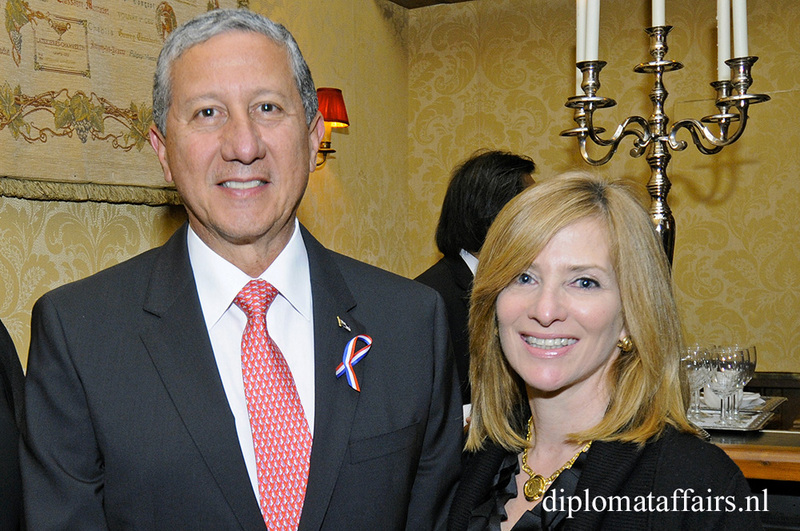 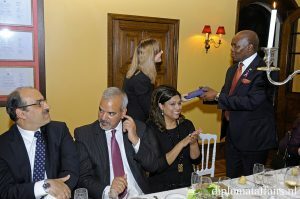 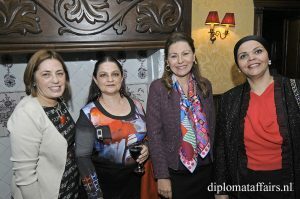 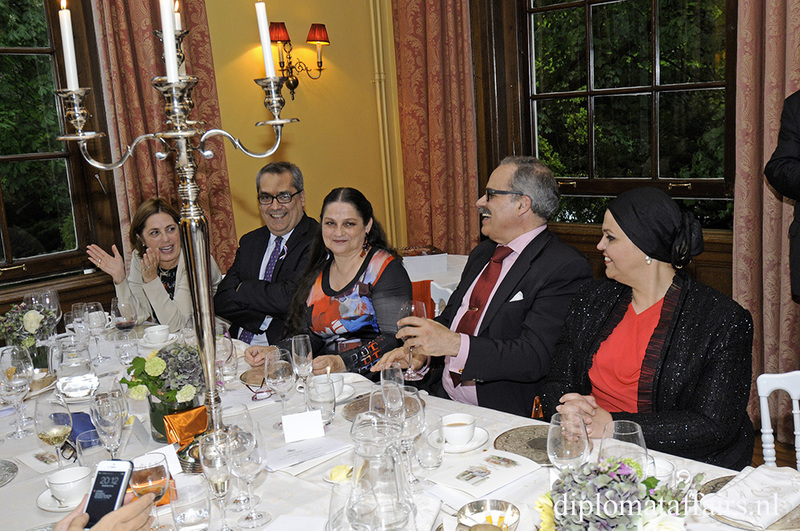 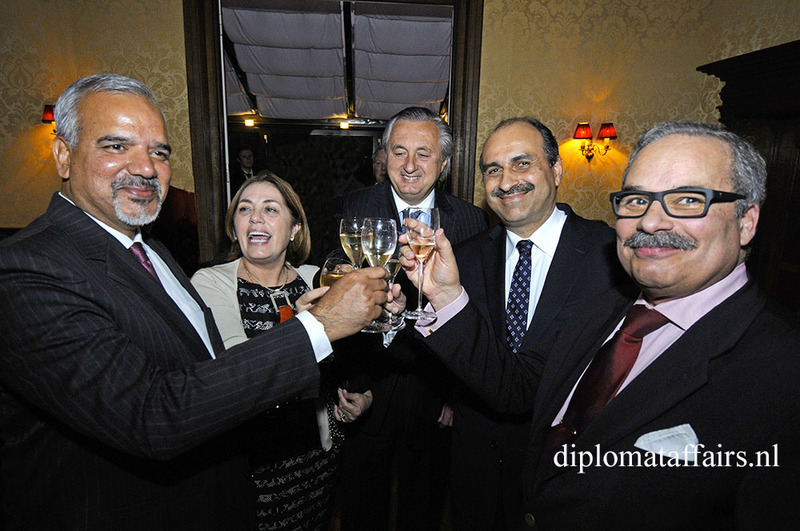 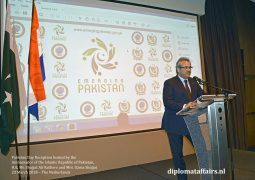 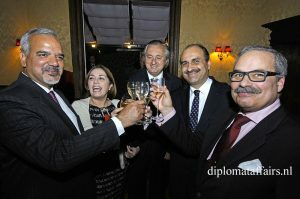 The seven Ambassadors were invited to dinner with their spouses and a number of selected guests in attendance. 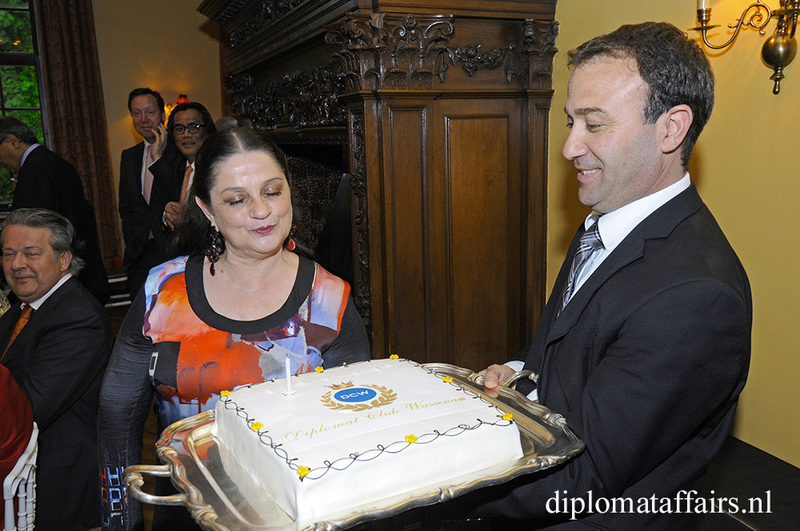 After dinner a huge birthday cake was delivered in honor of the birthday of Mrs. Véronique Micléa, the wife of His Excellency Mr. Carlos Herrera Rodríguez, Ambassador of Peru.